Last Thursday night I went online to the Sacramento Library website and requested for a book that the local library did not carry. If the other library branches carry the book, one of them will send the book to the library that has someone requesting for it. Today I received an email notifying me that the book is ready for pick up at the local library. Isn't that great? 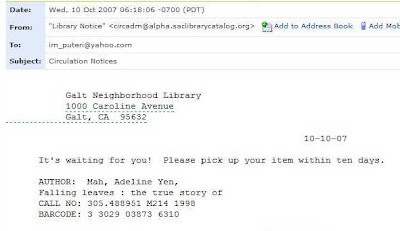 The book called Falling Leaves by Adeline Mah is the first book that I ever borrowed from the Galt Library. Now that I know that I can make a special request for a book if the local library doesn't carry it, I am more likely to borrow more books in the future. Way to go Puteri...very efficient. I think u request for the book, less then a week rite? Sure! Dunno if I know how to write a review though! I always forget what I'd just read!! Haha. Aha, heard alot about Falling Leaves.. I think nightwing did a book review on that book... Must read when I had time... You know la Puteri, with 2 monkeys at home, mana ada masa to read books, kan?? Ya la, Cat, so true! But then again I like to spend my free time in front of the pc! Haha, maybe write some paid posts? Haha. Haha, Nightwing, true! Now I can tell Doug, hey, it's my money, so I can spend however I want to! Hehe.